An exciting new indoor plant. It wasn’t easy getting Wendy Chalkers attention. But her Bougainvillea got everyone’s attention this week at Campbelltown Bonsai Society’s monthly meeting. Wendy has been growing this spectacular Bonsai for 11 years. Her husband Ray and her, share ownership of this plant. It all depends who you talk too. They both think they are responsible for its amazing display of flowers. Wendy prunes it every month. And Ray waters it, and applies the soil additives that ensure this plant thrives. He waters it every day during the summer heat and he applies Wettasoil so the Potting Mix doesn’t become hydrophobic. He feeds it monthly with Powerfeed at half strength. He says he used Tim’s Best Potting Mix the last time he repotted it. That made me smile. Wendy says it looked even better last year, but a cat jumped over the fence, and knocked her plant off the stand. A lower branch got broken off. But good gardeners don’t let a little set back like that upset them for too long. She got out the secateurs and worked her magic. Campbelltown Bonsai Society meet once a month, on a Tuesday night at 7pm, in the Ruse Community Hall in Oberon Rd. They have one of the biggest Bonsai Clubs in Australia, but they are always looking for new members. Last night a young newbie turned up. She’d brought along her Bonsai plant, that had been given to her as a gift recently. It was looking a little worse for wear. Club members gathered around and offered sensible advice. Her plant might be saved yet? I’d been invited to give a gardening talk. Not about Bonsai. These guys know more than me. I talked about growing indoor plants. As I drove into the Ruse Community Hall car park, I noticed that not one tree had been planted. How could Campbelltown Council get away with not planting any trees in this precinct for 30 years? 20 trees would make this place look so much better. Come on Campbelltown Council, lets really try to be a green city. I picked these up these Arabian Jasmine from The Plant Collectors Fair. They were in my car overnight. When I got into the car, in the morning, I was hit with this whoosh, of sweet fragrance. How can flowers that are so small and unassuming, have such a powerful sweet perfume? This plant is little known in the plant world unless you’ve come from an Arab country. It’s known as Arabian Jasmine or Sambac Jasmine. Once your nose smells it, you’ll be hooked for life. We have 30 plants only. This is the rare double flowering form. It’s an evergreen mild climbing plant. Perfect for pots or gardens. It flowers throughout the warmer months. Follow your nose to Tim’s Garden Centre. Scindapsus “Satin Pothos” is a climbing indoor plant, with these amazing spotted, grey, heart shaped leaves. It will spill over the side of your pot and hang down. It looks great in a hanging basket or grow it up a bark totem. Use our Tim’s Best Potting Mix for the best results. “Satin Pothos” likes a bright spot inside your house. We only have 20 plants. Easy to grow from cuttings, once you have one. “Silk Floss Tree” in the car park on Sunday. We have this spectacular flowering tree, growing in our car park, but we’ve never seen the fruit before. We are all plant collectors here, so something rare like this, gets the blood flowing. Karyn planted this rare tree about 25 years ago. I don’t ever remember selling them, so who knows where it originally came from. This amazing tree has huge thorns on its trunk that would stop anyone climbing it. The trunk is swollen like a bottle tree. It’s green at the moment but as it gets older the bark will turn brown. This tree grows in rainforests of Argentina, Bolivia and Paraguay. It’s botanical name is Ceiba speciosa. It has these spectacular pink flowers through summer and autumn. The huge seed capsules contain bean sized seeds that are protected by cotton or silk like fluff. These avocado sized fruit burst open as they dry. We are going to try and grow more trees from the seeds once this happens. This is a collectors plant. You won’t want one where the kids kick the footy!!!!!! It caused a kerfuffle because Hayden found the first seed. It looks like an Avocado. I went for a walk and found another. Call in to see this tree, while it’s in flower. I doubt you’ve seen it before. Since posting this story we have discovered that Macarthur House has one in the garden. It’s huge. Mickey Robertson has one in her garden, at Glenmore House. I want one in my garden too!!!!!! We have so many new and exciting plants in the nursery today. 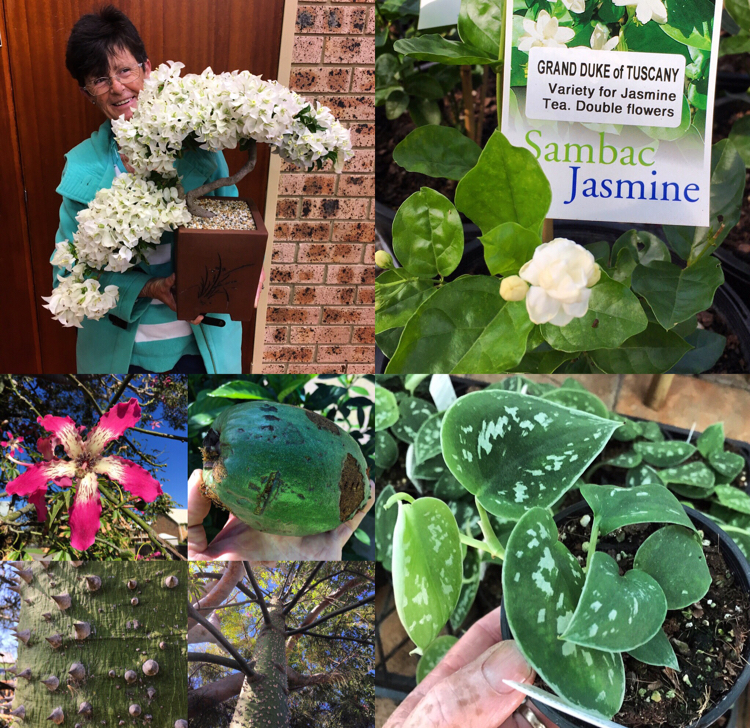 Hayden, Lisa and Lauchie have been filling up the nursery with exotic plants for Easter. We are plant lovers heaven!!!! !